Enjoy resort-style Living in this maintenance free condo at Crestview. Relax on the patio with a perfect view of the golf course on hole eight and nine. 24 Via Roma offers a great floor plan and close proximity to one of Wichita's premier country clubs. Seller just spend another $3500 on updating the balcony ! $16000 on NEW PLUMBING! This home has a beautiful wrought iron gate entrance that leads to your own private courtyard. Large foyer into a spacious and open living/dining room combination. TWO CUSTOM fireplaces. A spacious main floor layout offers a perfect arrangement for entertaining family and guests. The kitchen is finished with tile flooring, GRANITE COUNTER TOPS, island, GAS RANGE and plenty of cabinet space. The stunning dining room is with wood paneling, built-in bar and offers quick access to the large patio with beautiful views. The upper level features HUGE master suites with three walk in closets and two additional bedrooms, a second full bath. All three bedrooms have private balconies and wonderful space. The lower level includes a family room, full bathroom and a third wet bar. Don't miss this opportunity to check out this stunning home in desirable Andover Schools District! 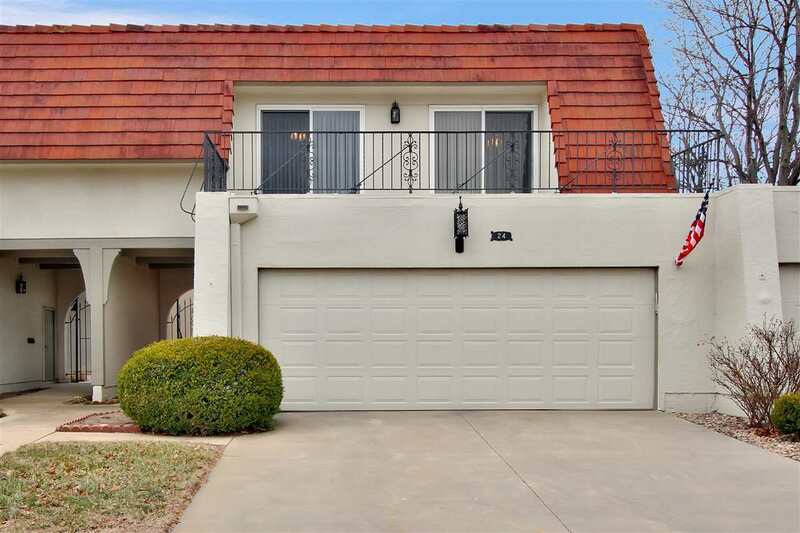 Great location with easy access to shops, restaurants, highway access, and the BEST of NE Wichita. Call for a private showing TODAY. In addition, HOA includes pool, clubhouse, sports court, trash service, sewer and water, sprinkler system, maintaining the yard and landscape, snow removal and exterior maintenance and insurance. Excludes roof, doors and windows.Homeowners Dues: $792.50 per quarter, Special Assessments $120.00 per quarter, Exterior Insurance.. $357.00 per quarter. Water included in HOA fees. HOA Maintains exterior maintenance, excluding roof, windows, doors, and courtyard. HOA includes exterior insurance, sprinkler, landscaping, roof (replacement only, no maintenance) snow and trash removal. *above fees are deemed reliable, but not guaranteed. Homeowners can reserve pool for private parties. Pool also has new coping and decking in 2016.